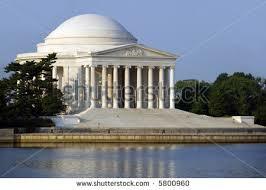 The design for the vaulted white monument to Thomas Jefferson, the third US leader, is based on the Roman Pantheon, its squat dome supported by 54 Ionic columns. In, appearing in a spectacular outline during the columns, is a 19-foot statue of a position Jefferson, and about are carved excerpts of the Declaration of Independence and other writings. The testimonial stands unaided at the distant end of the Tidal Pool, which reflects the monument in its outside, and all approximately the edge of the water are cherry trees, a present from Japan. These are individual of Washington's utmost attractions when they blossom each spring, nearby the basin with a cloud of pink flowers and distinguished with the Cherry Blossom Festival. All along the Cherry Tree Walk around the Tidal Basin, the Franklin Delano Roosevelt Memorial reflects twelve years of American History during four outdoor rooms. Each one is loyal to one of FDR's conditions of office as he guided the country through the Great Depression and World War II.